This special automatic or manual constant heat sealer is excellent for sealing cellophane film, humidity proof cellophane film, polyethylene film, aluminum foil coated bags and gusset bags, A beautiful mesh seal 5/8 inch wide by 8",12", 16" long. 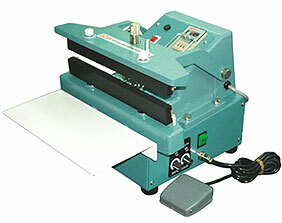 This sealer is ideal for producing wide seals of thick bags. Separate programmable timers for material thickness, congealing, and operating cycle.